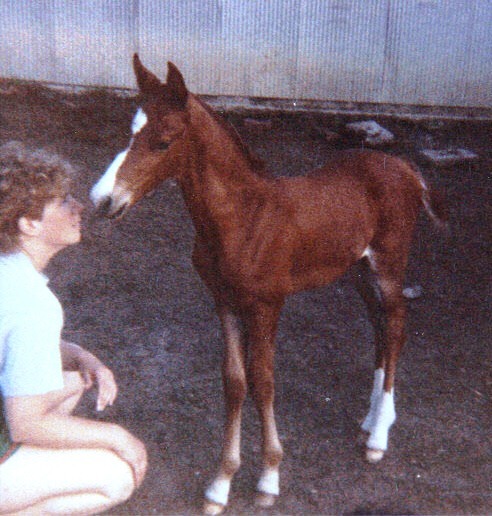 It's been a quarter century since we made the long trip to Topeka, Kansas to pick up two Morgan mares for our future breeding and showing program sight unseen. 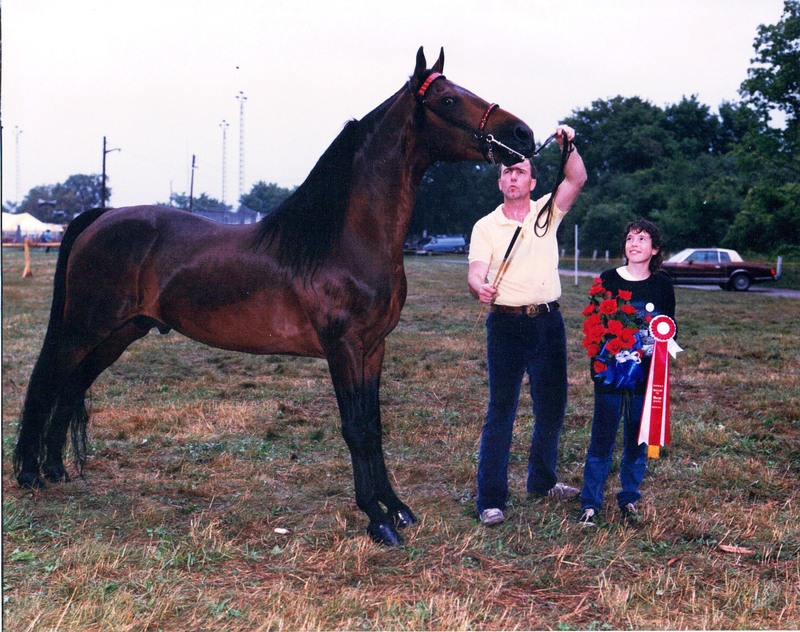 My eye was on Kennan's Rhapsody, the elegant champion young show mare that would prove to be a stunning show horse in another country and even better champion producing broodmare. Then there was little Memory. She was cute and small. The breeders had been disappointed that she wasn't going to mature much beyond 14.2. The size didn't matter to us as I was thinking of her as a driving horse. On paper she had a dream of a pedigree. 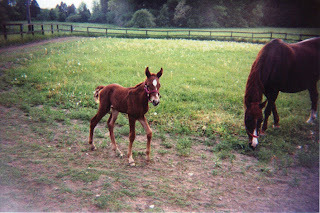 She was by Fairfield Fortune out of Whitmor Memory Lane. When you looked at her with a critical eye to conformation, things came up a little short in the literal sense. She had a big body and short legs. But mother, could this horse trot and hold her own. 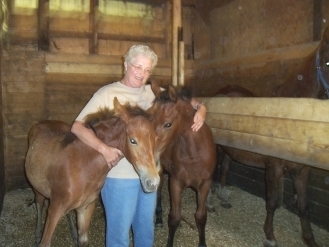 When we were first introduced to them on our arrival at the Kennan farm, Memory's owner was hand feeding her. When she hesitated, Memory bit down hard on her arm demanding her treat. I took notice and wisely gauged that this mare would need some manners. 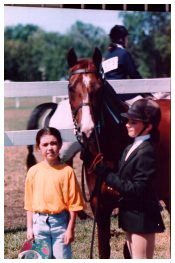 Memory was two years old and Rhapsody was four. We loaded them up and headed north to Canada. As the horses settled into their new home, we began to work with them. Memory was broke to harness and by the second season we hit the tanbark. 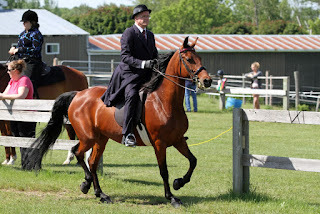 Memory strutted the show arena and was runner up to her stablemate Rhapsody. Both mares were elegant driving horses but since Rhapsody had the better build, she won over Memory. As a pleasure driving mare at home, just point her and she will go. There was a time when she trotted through a commercial sprinkler system that showered the roadway for approximately 300 feet. The sprinklers were crossing paths from one bed of seedlings to another separated by a narrow dirt road. Memory never missed a beat and drove straight and true right through the rain of sprinklers that dampened the roadway. I hadn't planned on a breeding avenue for Memory but thought we might get lucky with the right nick. 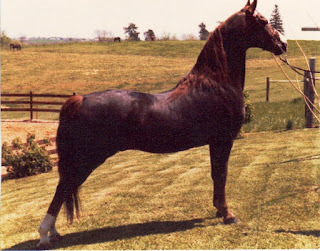 She was bred to two stallions during her life as an on again, off again broodmare. Trillium Samson and Serenity Intrigue were chosen as suitable mates. Samson went on to be our leading sire at the farm. 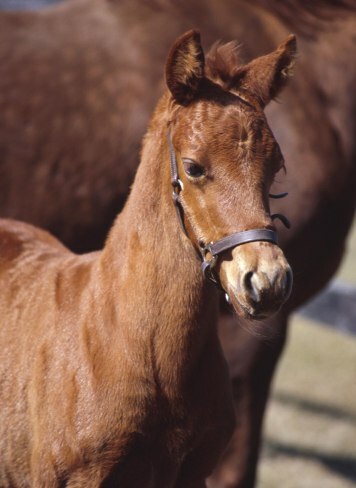 The elder Intrigue, a full brother to the legendary Val's Terry (18 times world champion) left us many wonderful offspring, both champions and wonderful talented friends. Both sires took the best of Memory and combined their own attributes producing a number of champions for us. One of Memory's offspring by Serenity Intrigue resides in Scotland. At one point she gave birth to twins. 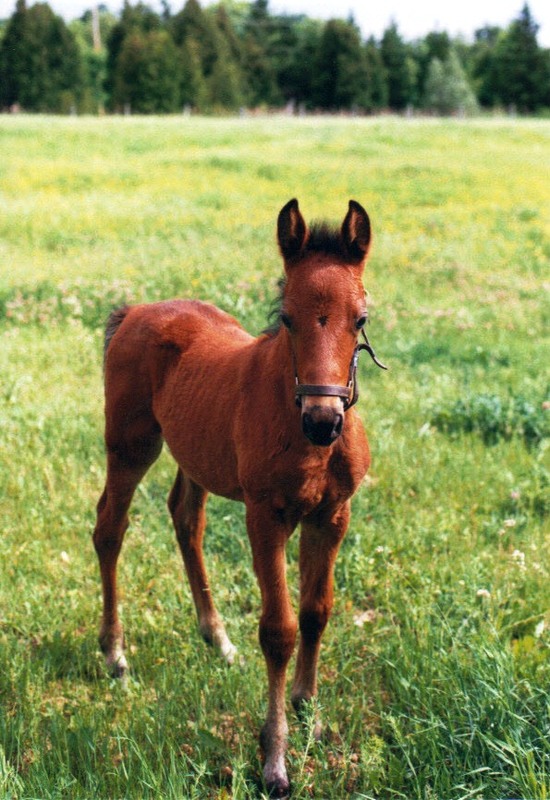 The filly, Trillium Spring Promise, survived and went on to great things. During her tenure as a broodmare, Memory also fostered another foal while nursing her own. 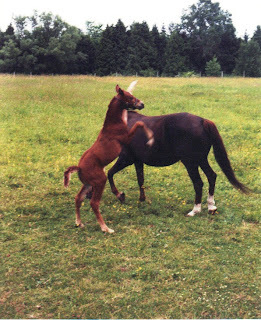 The tiny partbred filly had been rejected by her dam who also threatened this newborn with death. 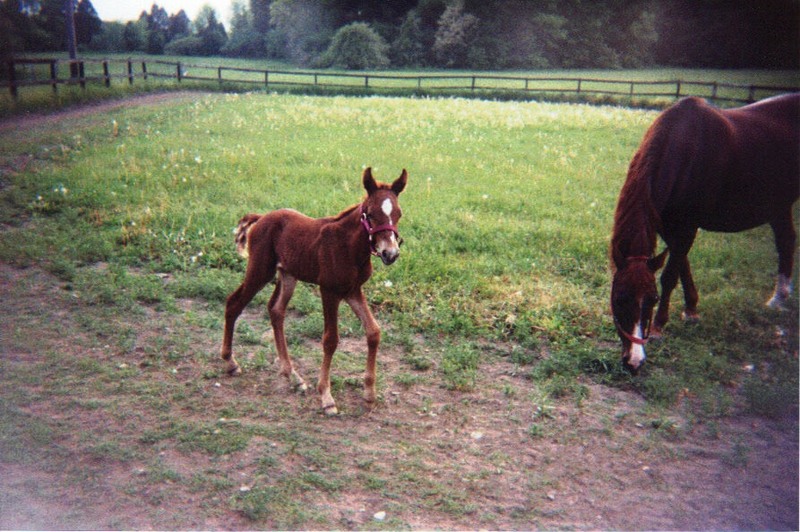 Memory's own foal was just two weeks old and seemed to be the only option for this filly to survive. With very little intervention, Memory accepted the foal along with her own foal Trillium Evening Primrose and raised the two to weaning stage. Late in her teens, Memory was introduced to riding. After years of being a driving lesson horse we decided to expand her resume of talents. She would become a great walk/trot horse for children and small adults. As our beginner horses passed on, Memory was move up the chain. 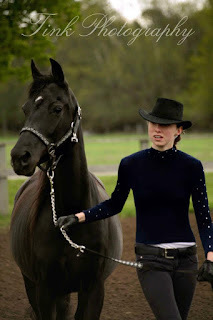 Today she is our beginner horse and at 27 she shows no signs of letting up.She seen the arena as a showmanship horse, walk/trot horse, leadline horse, driving horse, in hand horse and breed demo horse. 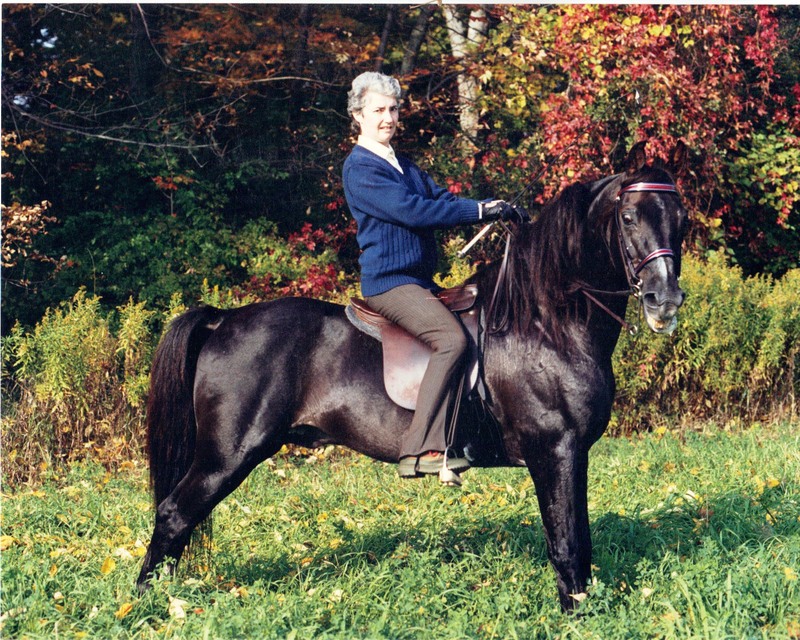 She has been a teacher, mother, clinician horse and babysitter. She has done it all and done it well.